Perched over the deep narrow valleys where the Alzette and Petrusse rivers meet, Luxembourg city is one of Europe’s most scenic capitals. With its rich cultural heritage and cosmopolitan vibe, there are many interesting things to see and do in Luxembourg. In fact, if you wish to explore the city, one of the best options is to follow one of the two walking itineraries (or both!) that the city has set out to guide visitors on their quest. Since my time in Luxembourg was limited, I picked the Wenzel walk to see a bit more of the city. Rated by the Council of Europe as an outstanding cultural itinerary, this trail combines information about the natural and man-made environments around Luxembourg city. The circuit covers 4.3 kilometers and highlights some of the oldest parts of the city, which date back from the Middle Ages up to more recent works from the 19th century. You can get a free leaflet with information and a map at the Luxembourg City Tourist Office (located on Place Guillaume II). 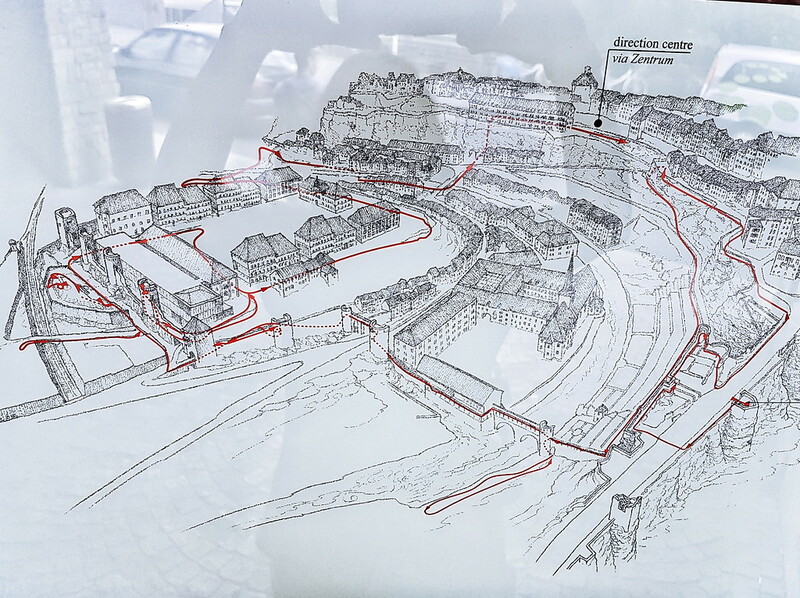 The Wenzel walk starts at the Bock promontory, the craddle of the city, which is the place where the first castle was built and started the development of the town that later became the capital of Luxembourg. This is also the site of the world’s longest casemates, a series of underground defense tunnels with fortified gun emplacements. If you can, spend some time exploring the Bock Casemates before continuing the walk. After crossing the Castle Bridge, you’ll reach the Chemin de la Corniche, a promenade lined up with pretty houses in warm pastel tones that offers impressive views on the valley below. As you continue descending the views keep getting even better and you’ll see some curious details, like the love locks on a fence and this peculiar circular viewpoint. While I marched down to the river, there was a building that kept catching my attention because it really stands out among the rest. With its needle-like tower and its location on the banks of the Alzette river, the St. Jean du Grund church is one of the most recognizable buildings in the Grund, the quarter located in the valley below the centre of Luxembourg city. Continuing on the Wenzel walk and after crossing a large retirement complex, I came across a few viewpoints where you can admire the Chemin de la Corniche from the other side of the valley. The views from here were just stunning and well worth the walk. The walk then continues on to an old defensive bridge before reaching the end at the Grund. There you can enjoy a well-deserved treat at one of the many cafes and restaurants in the area. And if you want to head back to the city centre, you can do so easily via a public elevator. This time, I chose to take a detour instead. A couple of days before I went on this walk, I had seen from the Place de la Constitution a beautiful green area down in the valley below and a perfectly manicured little garden area. I could not find a way there from above, so I wanted to see if I could reach it from below. And instead of following the Wenzel walk till the end, I decided to keep walking on the Petrusse valley. The area was full with locals enjoying a pleasant Saturday afternoon. There were people playing mini-golf, having a picnic, rolling around the skate park, jogging, and walking their dogs. And there was also a road that passes right beneath the Pont Adolphe and goes all the way to the city centre. But before reaching the top, take a right turn on a small road and you will reach the gorgeous garden that stands just below the Place de la Constitution. There are no signs for it, so it stays pretty empty most of the time. It was kind of amusing to see the people above trying to find a way to get down. 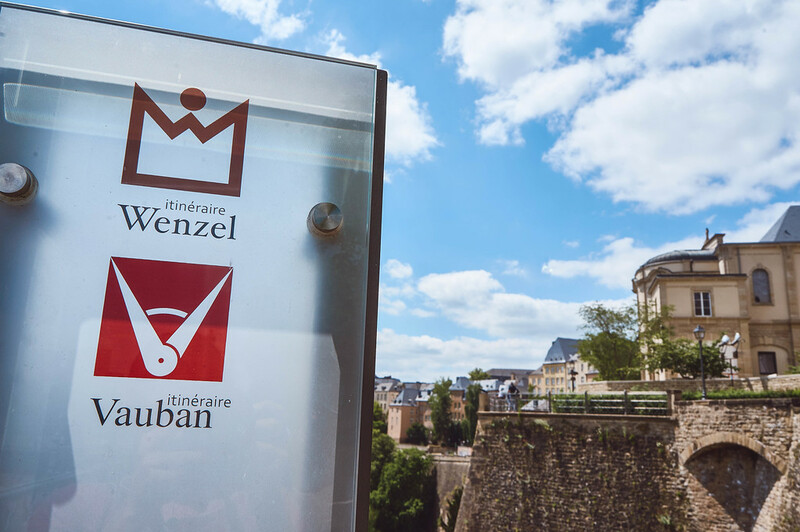 Overall, I really enjoyed taking the Wenzel walk as it not only took me to see some of the highlights in Luxembourg city, but I also saw some of its nice off the beaten path side. The walk takes between 2 – 3 hours, depending on your speed and how many photos you take. Although a lot of the walk is paved, there are a few steps and places that are not suitable for wheelchairs or strollers. And bring some water and snacks, because there are no places to buy anything along the way. 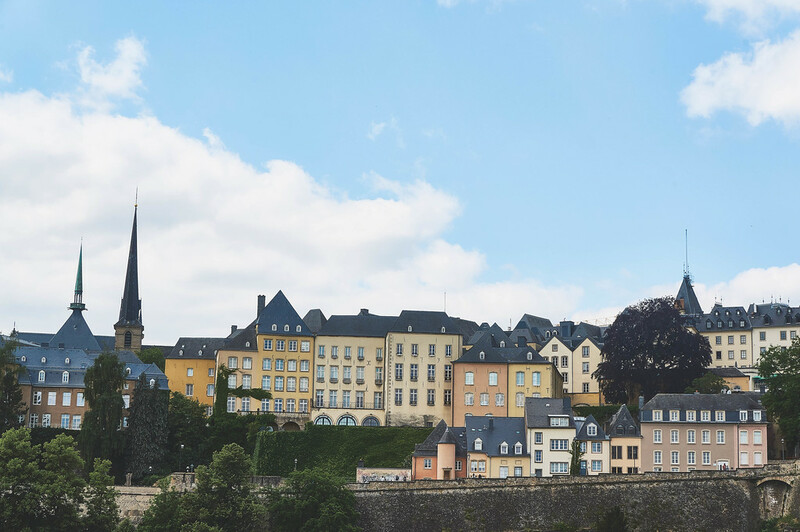 Have you been to Luxembourg city? Do you have any tips about things to do or see in Luxembourg? Leave a comment and let us know! Gorgeous views Bianca – looks like a really cool trail to follow. Certainly showcased Luxembourg City – it’s on my list. This is such a great guide for a great city! Love your writing style and wonderful narration! I really want to visit Luxembourg. All my friends who have been come back with such amazing photos! Thanks for sharing. I went to Luxembourg years ago but it was only for a day for work so I didn’t get to see much. I would love to go back and do this walk. It looks like you had the perfect day too. Your pictures turned out beautiful. Luxembourg City is simply gorgeous! And what a fantastic trail to follow – the views are stunning. I’m heading here in a few months so will now be adding the wenzel walk to my itinerary!